Admiring the Beauty and Personality of the Dog. “Her name is Harley Pretty Pretty Please. But when she’s bad, we call her Harley Davidson,” overheard in the West Highland Terrier show tent. Everyone has a funny opening line about their dogs, and it’s no different at the 2014 Florida Gulf Coast Cluster Dog Show. That’s the thing about this two-week dog show, now back in Brooksville, Florida after last year’s Ocala venue. The largest dog show in Florida is a casual and fun experience for the observer as well as for the competitors. Bring a lawn chair, settle in and admire the bevy of canine beauties. The goal is to have fun. Oh sure, participants are here to add points in a major show to achieve the ultimate goal, a championship. But, conversations are easy to strike up with the handlers, groomers, trainers and owners. In fact, one can wander into one of the two huge grooming tents to watch some of the world’s expert groomers prepping dogs for the show. And, everyone loves to talk about dogs, especially their own. We met Bob Busby, who has been handling show dogs for more than 30 years. “I used to show Rottweilers, and then I fell in love with the Norwich Terrier,” he told us, while holding onto the leashes of puppies Solo and Moon. Incidentally, how do you tell the difference between a Norwich Terrier and a Norfolk Terrier? “Norwich Terriers, ears up. Norfolk Terriers, ears down,” Bob reminded us. He and his dogs travelled from North Carolina to compete in the Florida Gulf Coast Cluster Dog Show. 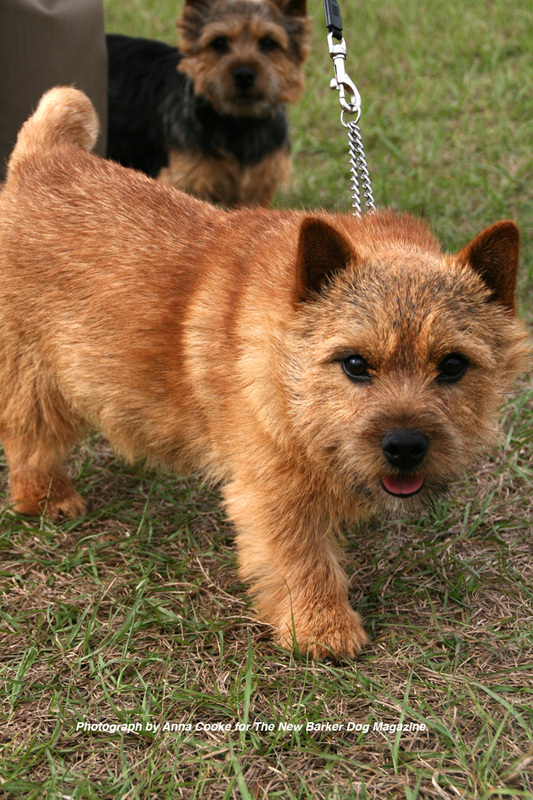 Puppies, Solo and Moon are Norwich Terriers. Photograph by Anna Cooke for The New Barker dog magazine. 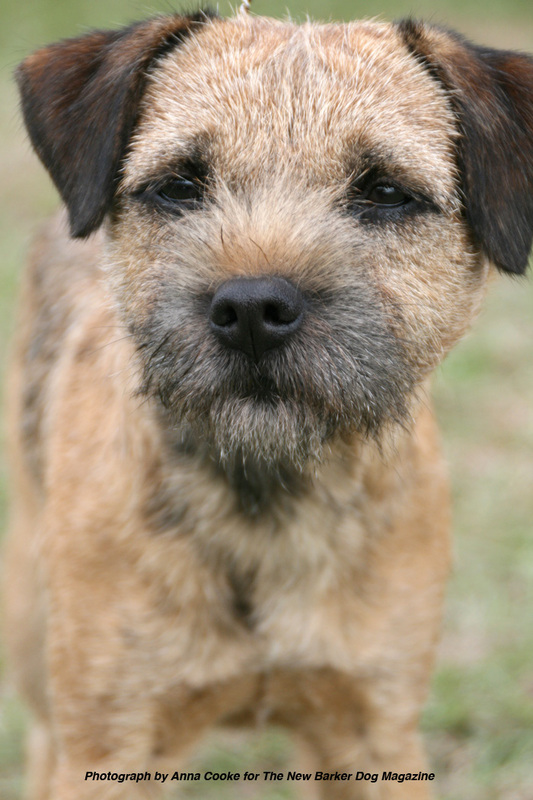 Most terrier breeds are remarkably similar in personality. They are quick to bark, quick to chase, lively, bossy, feisty, scrappy, clever, independent, stubborn, persistent, impulsive and intense. The New Barker staff can attest to all of those characteristics, found in our office dog, Dougie, a Scottish Terrier mix, adopted from Dunedin Doggie Rescue. The Border Terrier, however, is a bit different, we are told. We met Jagger, whose owner/handler said that the Border Terrier is the “most un-terrier of terriers.” He said the dogs “get along with everyone.” They are very relaxed, even though they can be tough as nails on the field when working events such as Earthdog trials. Their faces look similar to that of an otter. “The judges really look for the otter-like face. And their fur is very wiry. The more wiry, the better,” said Jagger’s owner/handler, both residents of Odessa, Florida. The Border Terrier originates from the borders of England and Scotland. Photograph by Anna Cooke for The New Barker dog magazine. Show Dog Decorum: It’s always proper etiquette (and smart) to ask permission to touch or pet the dog before you do, and especially so at a dog show. Remember, if the dog is about to get into the show ring, they have been perfectly-groomed. Touching or petting them may affect the look and feel of the dog’s fur. And that will certainly rile the handler. Yesterday, Monday, January 7 was the opening day of the Cluster, an AKC-sanctioned show, now in its 16th year. The temperatures began to drop as the competition among the Dachshunds and Terrier groups heated up. The first day’s Specialty shows were hosted by two Kennel Clubs: the Tampa Bay Terrier Club and the Florida Gulf Coast Dachshund Club. Those two clubs are also hosting today’s Specialty shows along with the Florida Suncoast Boston Terrier Club, Tampa Bay Poodle Club and the Orlando Poodle Club. 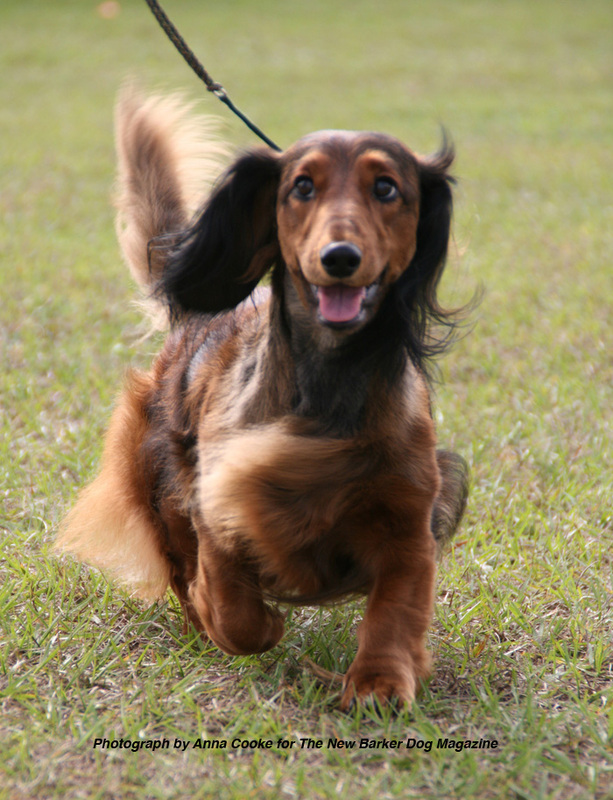 A Specialty show is restricted to dogs of a specific breed, such as the Dachshunds and Boston Terriers, or a variety of one breed, such as the Poodles, which includes Standard, Miniature and Toy. The All-breed shows of the Florida Gulf Coast Cluster will kick in to full gear on Thursday, January 9, hosted by the Manatee Kennel Club. There are no events on Wednesday, January 8. In addition to the Cluster of Dog Shows, which include Conformation, Obedience and Rally, there are about 40 dog-centric vendors on the 50-acre Florida Classic Park property. Admission is free. Parking is $5.00. Florida Classic Park is located at 5360 Lockhart Road in Brooksville. The best way to see champion dogs, up-close-and-personal: the Florida Gulf Coast Cluster Dog Show in Brooksville, Florida. Photograph by Anna Cooke for The New Barker dog magazine. Previous Previous post: The New Barker Dog Magazine Is Thinking Big. Next Next post: Victory, Victoria.